A [PDF version of this transcript] appears in the December 16, 2016 issue of Executive Intelligence Review and is re-published here with permission. The following is an edited transcript of a class given on Nov. 23, 2016, by Manhattan Project leader Philip Rubinstein. What I want to do is to, in part, talk about this question of Lyndon LaRouche’s Four Laws—really Hamilton, but also not just Hamilton, but rather Hamilton in the context of the Fourth of LaRouche’s Laws. I’m going to read just a little bit of the Fourth Law, which is Lyndon LaRouche’s expansion of Hamilton. We should be fairly clear on some things. Hamilton has a whole lot on the productivity of labor. In this sense, we will also discuss what LaRouche adds to the productivity of labor. Because what LaRouche cites as the fourth principle, the Fourth Law, is not simply in Hamilton. It goes further. Hamilton talks about the increase of the productivity of labor; of course his Report On Manufactures is a lengthy discourse on the importance of manufacturing from the standpoint of the improvement of the productivity of labor. Essentially, the reason he gives for manufacturing and the importance of manufacturing, the underlying principal, you could say, is the increase of the productivity of labor. 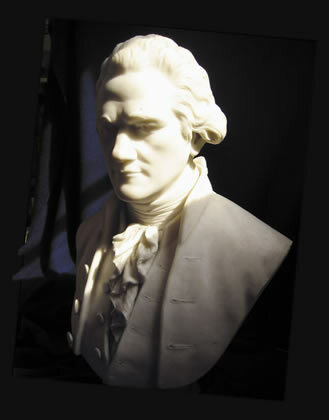 Bust of Alexander Hamilton by Franklin Simmons, 1906. Hamilton cites, through machinery for instance, “It is now proper to proceed a step further, and enumerate the principal circumstances from which it may be inferred that manufacturing establishments not only occasion a positive augmentation of the produce and revenue of society, but that they contribute to rendering them greater than they could possibly be without such establishments.” These circumstances are: (here’s a shocker for you) the division of labor! I think a lot of people have a problem with that, that indeed the division of labor is an advantage in productivity, particularly if it’s done properly. Secondly, the extension of the use of machinery—obviously the ability to expand labor, and as he goes on later, to expand the productivity of labor; the addition of a class of the community not normally engaged in productivity; the promotion of immigration from foreign countries; furnishing a greater scope for talents which discriminate men from each other; the affording of more ample and various fields for enterprise, and so on. The main point I want to make is that he started out with the division of labor and the extension of machinery. It’s very clear otherwise that the point he makes about manufacturing, “the foregoing suggestions are not designed to inculcate an opinion that manufacturing industry is more productive than that of agriculture. They are intended rather to show that the reverse of the proposition is not ascertained.” He says that people are saying that agriculture is productive and manufacturing is not. His argument is that manufacturing of course is indeed productive, and that, ultimately, it increases productivity, “and from these causes united the mere separation of that of the cultivator from that of the artificer has the effect of augmenting the productive powers of labor.” The point is it augments the productive powers of labor. In a sense, that is the whole point of the longest of Hamilton’s reports. The Report on Manufactures is far and away the longest one. The one point I want to make, a rather large point, before I cite one particular point from LaRouche, is, if you look at the Report on Public Credit, if you look at the Constitutionality of the National Bank, then, of course, there’s the Report on the National Bank, they all have a certain principle which you find in the Federalist from the very beginning. This is why Hamilton is often accused of being an authoritarian, a monarchist, a totalitarian, because, in every one of these, he starts from the standpoint that the Union, as it’s called later, during the Civil War, the nation as a whole, comes first. That comes before the states, in particular. This is very clear in the argument on the Constitutionality of the National Bank. Because what is it that Thomas Jefferson and Attorney General Edmund Randolph argue in particular? Their main argument is that the Federal Government does not have the enumerated powers to create a corporation, not just a bank, any corporation; that it has no right to create a corporation that has a legal identity. That’s their big argument. Then who has that right? The states! The states have a right to create corporations, and indeed, the Federal Government creating corporations interferes with the laws of the state. Almost the entirety of Hamilton’s argument for the constitutionality of the National Bank is that the states do not have any right that conflicts with the right of the Federal Government. Of course the Federal Government has the right to override the laws of states. What is the reason he gives for this? Sovereignty in part, yes, but it is basically the “General Welfare” clause. What is the object of the Federal Government? The Federal Government has the power to enact everything that it deems necessary to achieve its appropriate object. In fact, it is interesting to see how much these were the arguments that occurred. I don’t think the average candidate today could engage in the discussion. Their vocabulary is too limited. Hamilton asked: What is the object of the Federal Government? The welfare, the general welfare of the population; the general welfare of the country as a whole. Therefore, the National Bank, the right to incorporate the National Bank is not only Constitutional, it is necessary. One of the arguments that goes on, and you’ll see it if you read it, which is part of the value of reading it, is that Jefferson and Randolph—and you can see that this already is a southern split—Jefferson and Randolph want to say that the word “necessary,” which is in the Constitution, means only such things as are “absolutely necessary.” Hamilton says: Wait a minute; necessary doesn’t mean only those things which are absolutely necessary. In fact, it means quite the opposite: whatever you need to achieve the object of the Federal Government. So these are very important, but also very serious documents. The Federalist Papers of course opens up with the assertion that the Union has to come above the states. Today, what we have is an opportunity. To look at LaRouche’s recent Sunday discussion, was he recommending that we apply Einstein’s principle to our discussion with somebody in the Trump cabinet? Maybe, but I think he was getting at something a little bit different, which is, how do we approach the entire situation? Are we out to simply win somebody to our side, to count up the score on the cabinet or in the Congress or whatever? No, he is saying you have to have the same view that somebody like Einstein had; that, for Einstein, it was not a matter of the mathematics, per se. There is a lot of confusion on this. It’s not that Einstein didn’t use mathematics, but the mathematics was not the reality. That is something we can discuss at another time, because Einstein’s view, in his debate with people like Niels Bohr and Werner Heisenberg, the explicit debate was, essentially, do we know reality? It wasn’t things like, “is it waves or is it particles”—that is part of the debate; it is not unimportant, not something to overlook, but, the real debate between them was that you had (what we at a certain point called a positivist orientation), a very sharp denial that we do know reality, by people like Heisenberg, Max Born, Bohr in particular, because they were the ones who carried out the debate with Einstein to a large extent. Einstein’s point was: No, it’s not just that “God doesn’t play dice.” That was the clever phrase, you could say that was a soundbite, but that wasn’t all that Einstein meant. He meant: No, there is a reality. We’re not talking about the fact that things come into existence when we observe them and go out of existence when we don’t observe them. There is something real called the universe, and Einstein’s work was about the nature of that universe. I think what one has to reflect on is our whole conception, and LaRouche does allude to this in the discussion with the “Basement” (LaRouche PAC Science Team)—our whole conception of a universe, a universe that is developing, a universe that is changing, that this essentially rests on Einstein’s work in special and general relativity. Up to the 1920s there was no such thing as really a theory of the cosmos. It was just there. In fact there wasn’t that much there. It wasn’t nearly as big. We found it was a lot bigger than we thought it was, a lot more was in it than we thought. I find these things fascinating—there was an estimate at one point that there were about 200 billion galaxies. This was based on scanning, because we can only look at so much of the universe; telescopes have certain angles of observation and so forth. Now given the fact that we have an increased data base, which is actually going to be expanding a great deal more over the next 4 or 5 years, the estimate now is that we have 2 trillion galaxies. Two trillion galaxies! Now if you think that it is believed that the average galaxy has between 100 and 200 billion stars….you realize that there is something like 10²³, possibly, stars. That’s a big number. Now, think of the following, because part of what LaRouche is getting at, and this—we only have one access to this—is that the universe actually develops. It is not just a general idea. There is a real development somehow in the universe. As Vernadsky puts it, and LaRouche has referred to Vernadsky, there is a multiply-connected reality between the abiotic, the biotic and the cognitive. Now, for the most part, how do we think about it? We think the abiotic, somehow develops into the biotic, and the biotic develops into the cognitive. Now in one sense, in terms of time, at least in terms of the human species, something like that seems to have gone on. If you look at the human body, it carries the human mind. The human mind is somehow located where the body is, at one level. But the truth of the matter is, that the governing principle of the development of the universe is a cognitive, or at least analogous to a cognitive, process—that the way we discover things, and I think the way we act when we are actually discovering being creative, is the way the universe itself develops. Then it’s also the other way around. There is a cognitive principle, or a principle of development like human cognition, and that human cognition develops the universe. In other words, the universe produced us so it could develop further. The universe produces a capability for creativity, so that the universe can change, develop, expand, but expand in some direction toward further existence of cognition, toward discoveries. You have to realize that when we discover a physical principle and utilize it, we are not taking nature and using nature, so to speak. We are changing nature. Because what we do does not occur naturally, except for the intervention of human beings. You take nuclear fission, you take electricity in the form that we use it—these things don’t grow on trees! You don’t walk out and pick an electric wire off your tree, plug it into your house and light up your wife or husband as the case may be. These things are actual changes. We basically have the possibility, as we work on the subatomic scale, of using such things as the differences in spin, that is angular momentum of the object itself, other sorts of issues, (even though a lot of the science that is involved in this right now is strange epistemologically and methodologically), there are certain things we’ve learned to deal with. With the improvement in the methodological outlook, we could begin to use these things in an entirely different way. One point LaRouche made today is: You take Einstein’s work on relativity theory—we don’t really know how all this works. 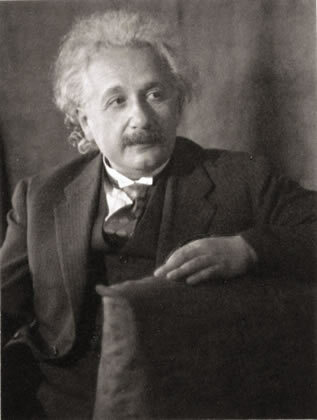 And, by the way, Einstein himself did not consider general relativity to be complete. He considered it, not that it was an unfinished project—his project, you might say was finished—but the theory was not a complete theory about the organization of the universe, even from the standpoint of gravitational force. We don’t know the distribution of matter, we don’t know some of the other aspects of the gravitational field, and so on and so forth. We have to recognize that what Einstein did discover, so to speak, is the fact that the universe that we live in is dominated by, and I mean this literally, we are talking about what amounts to a gravitational field or an electromagnetic field. These things govern the way we exist in the solar system, it gives us clues as to the way we have to look at galactic process, and we have to take this whole thing a great deal further, but these are the kinds of changes that we need to make. What we need is an entire change in our outlook on the process of discovering what is in the universe and that this is the nature of mankind. I’m sure LaRouche may have more to say about these things, but at least on one basic level, the question is: Do we understand what it means to say that the nature of mankind is creative discovery—by that I mean that for each individual human being, that is his or her identity. Now, what is human identity? The fact is there is a universal human identity. This I think is a great deal of the point LaRouche is getting across. Our identity is that human beings are capable of adding to, communicating and making actual discoveries of principle and being part of a process. For example, if you were part of the space program, it wasn’t just, “Okay, we’re going to the Moon.” It was part of a unified conception, that the United States—yes it was a race with the Soviet Union—but fundamentally we were out to discover the nature of the solar system. We even had a President who said that in his speech. There is the famous point, if you listen to the whole speech, that goes beyond that we are going to the Moon, where President Kennedy talks about going throughout the solar system, other planets, and so on and so forth. The idea was then we had a mission as a nation, but also as part of the planet as a whole, to make a voyage of discovery. Indeed you had this strange kind of event, because you had the all the Apollo projects, and that stopped. Then there was sort of no space program, and one day you wake up and find that Voyager has gone another couple of zillion miles, and suddenly there was a spurt of something of a space program, and then it would die out again, and then you would find that Voyager went a little further five years later, and so on and so forth. But the idea, that for every human individual (that is in fact how we’re supposed to be treated; that’s what we’re valued for), you have to be willing to accept the fact that if you are not at least making the cooperative effort, if you are not working on creative projects, creative purposes, then you are not truly human. That’s the difference between us and the animal. Yes, you can say we have the potential and we should be treated that way, but the reciprocal side of it is that you’re supposed to think of yourself and act in that way. Otherwise, if you strip us of that, there isn’t that much that distinguishes us biologically, from animals. Every way we are distinguished comes from the fact that we are creative beings. Every thing about our physiology that distinguishes us is tied to the fact that we are cognitive. For example, speech, language, the ability to do what we do with language, is a cognition driven process. It is driven by the development of human capabilities. And in a sense, this is the concept of productivity. We’re talking about an increase in the creative, productive powers of labor, which means the ability to discover; it also means the ability to assimilate new knowledge, to act upon it, and without that you don’t have a policy. That is why, for example, infrastructure on its own is not itself a solution to the problem. Infrastructure, like a lot of things, can be used a lot of ways. It can be used for good. Conversely, if you’re just running military logistics on a highly sophisticated infrastructure, that’s not what’s needed. That’s not going to advance human society. It doesn’t increase the productivity of labor. We’re talking about creating a labor force which is like an intellectual labor force. A labor force that organizes itself to assimilate and produce new ideas, not just suggestion box ideas. A labor force which thinks of itself as part of the process of investigating nature, of exploring space. Some object that, “Well, not everybody’s involved in the space program,” but if you put this together with a real nuclear program and all the infrastructure you need to back up a space program, and all the engineers, and all the schools and all the scientists and all the research facilities, then you realize the entire society is lifted, in terms of its productive capabilities and mission orientation, and indeed the going into space is not just to do an adventure. It is to find out more about the nature of the solar system: How was it created? How do we control the chemical processes? What kind of life is there? What does it mean if we find other forms of life, even if they’re primitive forms of life? What is that going to mean in terms of our ability to develop? V.I. 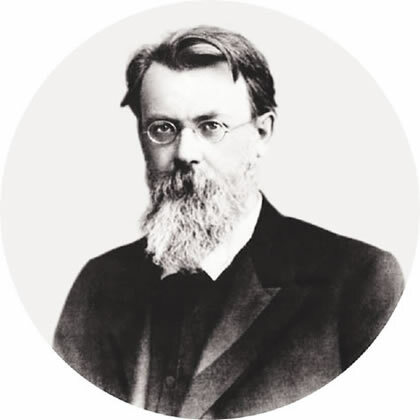 Vernadsky’s systemic principle of human nature, is a universal principle, which is uniquely specific to the crucial factor of the existence of the human species. For example: “time” and “space” do not actually exist as a set of metrical principles of the Solar system; their only admissible employment for purposes of communication is essentially nominal presumption. Since competent science for today can be expressed only in terms of the unique characteristic of the human species’ role within the known aspects of the universe, the human principle is the only true principle known to us for practice: the notions of space and time are merely useful imageries. Now maybe at some point we can get a discussion, it requires some work, to get at what this means. Because, he doesn’t necessarily mean, as for example with space travel, “Okay, we have so much space to traverse; we have so many ways to do it, that maybe there is even a time dilation and so on and so forth,” Rather, what he is talking about is that there is a quality of space and time that is determined by the human mind—that’s determined by the creative nature of the universe itself, that created the solar system. In a certain sense we are traveling in time when we make discoveries; we are discovering where things came from, we are making the past part of the present. All of a sudden, if we know what the past of something is, so to speak, its development, we know a great deal more about what it is now, including why its chemical properties are what they are, how they may have been created, what they may tell us about the processes going on that’s a useful part of the solar system. We know there are many, many anomalies in the solar system: the tilt of planets, the nature of the planets, the number of moons, the fact that some of these moons have hot interiors that they are not supposed to have. Where did all this come from? So the question of space and time are questions of understanding the unique processes of the human mind. And, thereby, that’s our access to whatever the creative process in the universe is, whatever people want to call it. In that sense, what we have to bring into the situation is very different, and also means a whole different approach to the development of this planet. We now see for example, in South America, in Africa, nations are saying, “We are going to have nuclear energy.” This doesn’t just mean they will have nuclear energy plants. It means there are more people who begin to understand what a nuclear process is, how to control radiation, how to use it. It means more potential discoveries, because we are going to have more people working in these areas. That’s what the BRICS [Brazil, Russia, India, China, South Africa] really means. You have to have a certain vision. If we could bring the United States into the world landbridge now, even given as dilapidated as we may be, if you look at this from a somewhat different standpoint, look at it from outside the United States. First of all, look at the lack of conflict. Look at what this may mean to the Russians, the Chinese. Imagine a Big Three with China replacing Great Britain. Now, if that’s organized around a real economic development plan, then we have something of tremendous value. And in a sense, that’s how we have to look at the Four Laws. Step number one is to get Glass-Steagall, but we have to think of these as four laws. That’s up to us. You don’t have to always say, “Yes, Glass-Steagall, but that’s not enough.” The real point is to say Glass-Steagall, and… This is why we’re doing Glass-Steagall. We’re doing Glass-Steagall so we can reinvigorate the space program, increase the productivity of labor. We’re going to set up a national bank and credit institutions and so on and so forth for these same purposes. 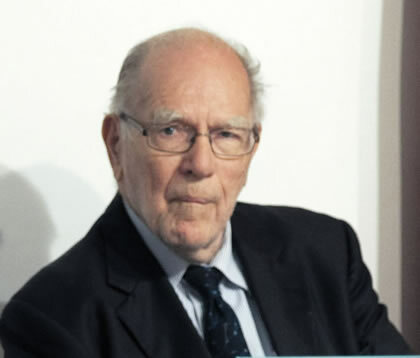 Lyndon H. LaRouche, Jr. at the June 26, 2016 Schiller Institute conference in Berlin. I think, in some ways, that’s why LaRouche invokes Einstein on these matters. But that’s the level of thinking that you want. What was Einstein interested in? He was interested in what’s the real nature, what’s the reality of the universe? What are the actual principles that are operating? How do we get the idea of a single universe? By the way, this is a problem that we still have, and, frankly, after a period where people pooh-poohed this, now at least it is recognized that the ability to incorporate the subatomic world, so-called quantum phenomena, with the questions of gravitational reality, general relativity, special relativity, to bring this together in some concept (not necessarily one mathematical equation): it’s a concept of a unified theory of the universe, a unified field. We begin to understand how these things work together. Every time we discover something, we discover more. For example, one of the differences between Einstein and some of his critics is—their view was the Uncertainty Principle, and I won’t go into the details of that now. One version of that is that you can’t measure something smaller than the wavelength of the light you use to measure it. The problem is that you are going to hit it with this light that is a lot bigger than it is, and you’re going to change its position, change its momentum. Now some of this gets generalized that we’re always interfering. And there’s some truth to that. We are in the universe, that’s the real trick. We’re not looking from outside the universe, over the edge of the box, trying to see what’s going on. If you look at it that way, yes, we’re not really looking at what we think we are looking at. But if you realize we are inside the universe, and you realize that the universe reacts to what you do, and you understand what you are doing, then you have the ability to look over your shoulder and self consciously reflect on the nature of the investigation you are carrying out. And you can find a way to get to that reality. What’s the reality of what you have done? And that’s Einstein; that’s the question Einstein raises. Now LaRouche said, when I was talking to him yesterday, that we are trying, in a certain sense it’s our purpose, to get completion. We want to have a completed conception of our institutions, of what they’re doing, and we are oriented toward completing our view of the universe, even though it may never be complete. The point is we strive to make it ever more complete. In doing that, that’s how the human species survives. We can’t exist any other way. The virtue, in one sense, of the classical arts, is that we don’t have to wait. You can do classical composition now. You are not going to be able to do the whole solar system now. Frankly, that requires a massive conjoined effort, a common effort of the human species. The only way you’re going to get that is the kind of processes that bring about a new paradigm based on a multiple bringing of other cultures and their classical forms together with ours; that’s going to be the basis for the kind of conjoined development that the planet needs. We’ve seen that somewhat in the organizing here. We know there was something of a metaphysical impact of the concerts [the 9/11 memorial “Requiem” concerts held in New York City in September 2016]. You can’t always point to it and say this person was made better, that person was made better. . . maybe you can in some cases, but the entire situation was made better, not just internally, but in terms of people’s relationship to us, and the impact that that had. You have to think in terms—part of the point LaRouche is making, with the Fourth Law, with his reference to Vernadsky—of what is the actual nature of space and time, and it’s not a matter of science fiction, it’s not a matter of can we put a guy in some little thing and send him back in time. That’s not the question. We can, in fact, use the fact that cognitive time is different than the time that unfolds in experience. We can take the time and experience and, from a cognitive standpoint, it can change our understanding of what happens. It can give us powers over the universe that didn’t exist up until the point we made those discoveries. Again it’s kind of hard to imagine, in part because there have been so many differences; what was the world like before there was electricity? How much work did you have to do? You lived in the dark. For example, if you lived in this part of the northern hemisphere, you lived in the dark a good deal of the time. Or, think of the following: that the average person, a hundred years ago, even leaving aside the fact that people died at childbirth and so forth, if you were sixty years old, what was your life expectancy? Maybe three or four years. What is your life expectancy today at age sixty? Admittedly it’s shrinking, but what is it today, maybe fifteen or twenty years? And obviously with reasonable health care, we can create a potential, where at sixty, your life expectancy is twenty to thirty years. What was it like growing up when you actually realized that you were not likely to make it past forty-five? Take someone like Schiller; yes there were some that made it further, but if you go through the history of great people, an awful lot of them just in the normal course of events didn’t make it past fifty-five or sixty—Shakespeare, Beethoven, even FDR. Most of the people in his cabinet were gone between sixty and seventy. That’s a whole change in the situation. That changes time; sometimes not in the best ways. People think they have forever to do something, but that’s not the case. You have a certain amount of time to do something, and I think what we have to realize is that the question of the productivity of labor is a cognitive question. It is a question of creativity, and that’s the nature of human identity, period. There aren’t too many of us that are geniuses, admittedly, but at least we are working to make that the way in which the human species acts and gives that opportunity to people in general. That’s the identity. It doesn’t mean everybody is going to be a whiz kid, but it means that’s what you respect, that’s what you fight for. That’s what you see in other people. And you recognize that this is only done as a joint effort, as cooperation amongst nations. Remember, LaRouche has been talking about this whole question of finding some basis for a whole different relationship, where sovereignty is important, but is not the final word. This, by the way, was very strong coming out of World War II. MacArthur and many other people thought that because of nuclear weapons, in particular—and FDR having seen World War II—they said we need a different relation among nations. That’s why FDR pushed the United Nations, as not a place that overrode national identity, but brought people together to develop the planet as a whole from the standpoint of all of these nations. And if anything, that’s needed more now than it ever was. But LaRouche’s point is that if you are going to do that you have to base it on an appropriate understanding of the nature of mankind. That’s in effect what’s involved in the fight for these Four Laws.